A fleet of electric buses is coming to Chicago, and it’s great news for clean tech. The private sector is about to embrace battery-powered buses. That’s a great way to make transportation greener. 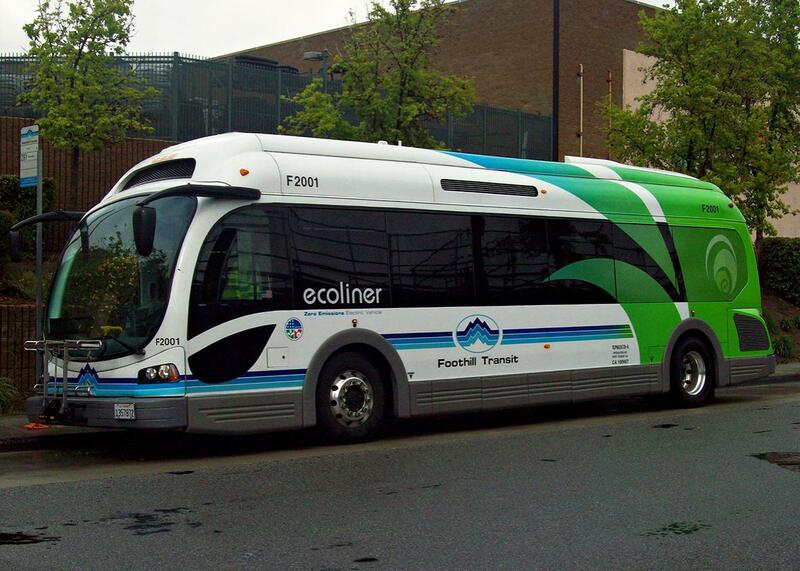 A 2010 Foothill Transit Proterra EcoRide. The electric bus–maker Proterra just signed a deal with a real estate management firm for a fleet of 10 new buses in Chicago. Next month in Chicago, in a development that few will notice, a fleet of 10 new buses will start slowly plying a two-mile loop between transit stations and two massive office complexes on the northern edge of Millennium Park. It’s noteworthy for a few reasons. First, the buses are electric. They’re made by Proterra, an all-electric bus-maker based in South Carolina (that I profiled a couple of years ago). Since shipping its first bus to Foothill Transit in Southern California, Proterra has sold 312 zero-emission buses to 35 different customers. Second, the operator of these buses isn’t a municipal transit agency or a university or a nonprofit. Rather, for the first time, a private, for-profit U.S. company will be operating an all-electric bus fleet. For 20 years, Jones Lang LaSalle, the global real estate management firm, has been running diesel buses between major transit stations in downtown Chicago and two giant office complexes it manages, the Aon Center and Prudential Plaza, as a service to tenants. Each building hosts about 13,000 workers. The buses make about 82 trips back and forth between the buildings and train stations daily, servicing about 35,000 riders per month. Many companies—most famously Google and Facebook—run shuttles to get employees from cities to suburban office parks, or to get them those last two miles from train lines to offices. The trend is likely to continue. Investment in mass transit has lagged. Meanwhile, companies are packing more people into the same space—open-plan offices. Office buildings are becoming more densely packed. And companies are stepping up on transporting their workers there. The third noteworthy aspect is the financing structure. Previously, all of Proterra’s customers have bought the buses, which cost several hundred thousand dollars. Instead, JLL, aided by a $150,000 federal grant, is leasing them for several years. That relieves JLL, which is in the business of managing buildings, not maintaining complex electric buses, of the cost and responsibilities of ownership. Offering the financial innovation of a lease is a tactic we’ve seen elsewhere in the clean tech industry, most notably in rooftop solar panels. Commercial users are often ahead of consumers when it comes to investing in energy efficiency and emissions-lowering initiatives. That’s in part because they have the balance sheet to finance greening efforts. But it’s also because virtually every public agency and large company has a comprehensive sustainability plan—using solar, or saving water, or installing electric chargers—in the U.S. and around the world. “We are certainly supporting the sustainability and green building initiatives that are out there,” said Brian Oyster, vice president and general manager at Jones Lang LaSalle. Deploying the buses will help the company achieve coveted LEED certifications for its buildings. So while all-electric and hybrid cars have achieved only a vanishingly small market share—in September, about 10,000 all-electric cars were sold in the U.S., representing .7 percent of all car sales—electric buses have made more impressive headway. Aside from Proterra, the Chinese company Byd, which makes electric buses in California, has made sales to transit agencies in Palm Springs, California, and Washington state. A Proterra executive suggests that the 5 percent or more of the new buses sold this year could be all-electric or hybrids. Navigant Research believes global sales for buses with electric drives—including hybrids and plug-in buses—will rise from 119,000 in 2016 to 181,000 in 2026. That’s still a small minority. But buses represent a significant, if unsexy, opportunity to iron emissions out of a sector of the transportation industry. They account for more rides each year than heavy rail, light rail, and commuter rail combined—and for about half of all public transit trips. We may have an incoming presidential administration that is openly hostile to electric vehicles and efforts to reduce emissions. But companies, industry groups, and regional agencies all have their own agendas. And now that big, image-conscious companies have a mechanism to put all-electric fleets on the road, the numbers could rise quickly. If the Google bus and its siblings were electric, they would probably still engender some hostility. But at least they wouldn’t be polluting the gentrified air when they idle.